Sir Simon Rattle’s departure from the post of Chief Conductor of the Berliner Philharmoniker is here marked by a de-luxe issue on the orchestra’s own label. The work selected for his pair of farewell concerts in June 2018 was chosen very deliberately: it was with Mahler’s Sixth Symphony that he made his debut with the orchestra in November 1987 so a repeat of the work at the closing of what is inevitably being referred to as the Rattle era represents neat symmetry. Happily, an audio recording of his debut concerts survives and this analogue recording has been remastered and is here offered on a single CD and also on the Blu-ray disc. The Blu-ray also includes the audio recording of the 2018 performance and a video of the second of the two concerts. The choice of Mahler’s Sixth was a bold one for the thirty-two-year-old Rattle’s debut with the orchestra. Although the Berliner Philharmoniker was quick to play the symphony for the first time – Oscar Fried conducted the orchestra’s first performance of it in October 1906, just over 4 months after the work’s premiere – by the 1980s they were not especially noted as exponents of Mahler’s music. Karajan had started to play some of the symphonies with them fairly late in his career and the Sixth was one of those they had recorded together in the late 1970s. Otherwise, for its Mahler performances the orchestra was reliant on guest conductors, such as Barbirolli, with whom they performed the Sixth in January 1966 (Testament SBT-1342). Incidentally, Barbirolli, like Rattle, placed the Scherzo third; Karajan placed that movement second. That relative neglect of Mahler was to change with first the Abbado years and then the Rattle era. In his biography of Rattle, Nicholas Kenyon relates that when Rattle was first invited to Berlin his preferred programme choice was the Mahler Tenth in the Cooke performing edition; eventually both sides compromised on the Sixth. In the short bonus video Rattle reminisces about that first encounter with the Berliners. He had performed the symphony a couple of nights earlier in London with the Philharmonia and he arrived at the Philharmonie, accompanied by his parents, with a suitcase full of marked-up parts. They spent about 20 minutes trying to locate the entrance to the hall and, as Rattle observes, at least that stopped him getting too nervous! There are some black-and-white photos of the concert and even at an engagement like this Rattle had the confidence to conduct the massive work from memory. As you might infer from the timings, there is, at times, greater urgency in the 1987 performance but, equally, there are times in 2018 where Rattle has the confidence – and the trust in his orchestra – to be more expansive than his earlier self. I was somewhat surprised, though, to see that his CBSO recording for EMI, made under studio conditions in Watford Town Hall in December 1989, is longer overall than either of those Berlin readings. That performance, to which I haven’t had an opportunity to listen for some time, weighs in at 86:18. I haven’t listened to that Birmingham reading again in evaluating the Berlin set, but all four movements last for longer than in either Berlin performance. The 1987 traversal is pretty impressive. The first movement has plenty of urgency and dynamism; though the nostalgic episodes are caringly done, Rattle does not linger excessively. The end of the movement is exultant but, actually, I think it’s a bit too hectically paced. The Andante moderato second movement is warm and poetic. However, I had the sense that not all the transitions were as expressively shaped as might have been the case if the conductor and orchestra had been better acquainted. It is noticeable, however, that even with an orchestra that was less experienced in Mahler than would one day be the case, he encourages the use of portamento for expressive effect and gets what he wants. There’s an ardent urgency at the movement’s climax. Conductor and orchestra give us a vivid depiction of the scherzo, its grotesque side well brought out. The altväterisch trio sections are nicely inflected though, once again, I sensed that Rattle might have been more daring with an orchestra he knew better. Much of the vast finale is biting and intense in this performance, as it should be. The build-up to the first hammer blow is very tense and after it Rattle drives the music along very strongly. The second hammer blow – and its aftermath – is, if anything, even more nerve-wrenching. In these pages the music is impelled forward in a way that a conductor can only do when working with a virtuoso orchestra – Rattle must have felt as if he were riding a powerful thoroughbred; you have the sense of being on a knife-edge. The sparse, dark coda has an air of exhaustion to it; this is a bleak passage of annihilation. No applause is retained on the recording and I’m rather glad of that. This performance is a conspicuous achievement, especially for a debut, and it’s small wonder that the young English conductor was invited back to Berlin. Fast forward three decades and we have Rattle leading the same symphony in his final programme after 16 years as chief conductor. I wonder how many members of the orchestra remained from the 1987 performance; perhaps a few, but watching the concert and seeing the many young players in the Berliner Philharmoniker’s ranks I strongly suspect that quite a number of the 2018 cohort had not so much as entered the profession when Rattle made his Berlin debut in 1987. I did most of my appraisal of the 2018 traversal viewing the video of the concert. The first movement has a bracing core tempo, though the pace is not excessive. The ‘Alma’ theme surges and blooms. Now, with 16 years of familiarity at his disposal, Rattle makes the transitions more expressive and smoother than was feasible in 1987. So, for example, the pastoral music with cowbells is lovingly done, though Rattle doesn’t draw out the music excessively. The playing of the Berliner Philharmoniker is simply phenomenal, as is the case throughout the symphony; they display blazing commitment and intensity and yet in the more relaxed passages their collective and individual finesse is quite remarkable. The exultant end of the movement is not as hard-driven as was the case in 1987. The gentleness of the Andante moderato is the perfect foil to the conclusion of the first movement, and all the more so when it’s played with such delicacy and refinement as is here the case. The Berlin string tone is absolutely gorgeous while the woodwind solos are simply sublime. Throughout the movement you can see the players keeping an eye on their conductor but it’s just as apparent that they’re listening to each other with great care: it’s as if Rattle is conducting a huge chamber orchestra and the flexibility of the orchestra – allied to undoubtedly intense rehearsals – ensure that all the many nuances in Mahler’s music come through. I never got the sense, as I did occasionally in the 1987 performance, that any expressive moulding didn’t quite come off: orchestra and conductor are all on the same wavelength. After the radiance of the Andante moderato the Scherzo comes almost as a rude awakening. The performance is trenchant and vividly etched; all Mahler’s vibrant colours and sardonic humour come out. The orchestra articulates the music superbly and imparts a nice tang to the altväterisch episodes. Rattle allows almost no break between the Scherzo and the finale: did he do the same in 1987, I wonder? This amazing movement receives a gripping, passionate and dramatic performance from a virtuoso conductor and orchestra right at the top of their game. Yet there’s no sense of virtuosity for its own sake: everything is harnessed to laying Mahler’s vision before the listener as vividly and as tellingly as possible. The nostalgic ‘alpine’ episodes are expertly judged – the cowbells and celeste ideally balanced – and give us a few moments of essential repose during the turmoil of the finale. The twin hammer blows, delivered by one percussionist striking a wooden block with an immense mallet while simultaneously a second player strikes a bass drum, are cathartic moments, each unleashing a musical rip tide. In all, this is a magnificent account of one of the most remarkable movements in symphonic literature. At the end Rattle manages to hold the silence for a short while before a huge ovation, which just goes on and on. Since the video is a souvenir of a great Berlin occasion, I’m not surprised that the film runs on, showing the extended appreciation for the performance. Eventually, Rattle stills the applause and, in a brief, one-sentence speech (in German) assures his “wonderful” orchestra and Berlin musical public that they are “anchored deep in [his] heart”. It’s obvious that he’s very moved. Clearly, one wouldn’t want to watch the ovation repeatedly but I was glad to see it once. Watching the video of this concert gives you a genuine sense of occasion. The picture quality and camera work are first class, as is always the case with this label. The Blu-ray sound is very good too. The sound for the 1987 performance is pretty good – I listened to it in full using the BD-A stereo option and I sampled the CD too. However, the best sound of all is experienced when you play the BD-A version of the 2018 performance. Here, the sound is rich, detailed and presents the performance in the best possible way. The bass in the BD-A of the 2018 performance is outstandingly well reproduced. The 2018 performance comes up very well in the CD option also but from now on I think the BD-A of the 2018 performance is likely to be my preferred part of this package. What of the rest of the package? The documentary Echoing an Era is very interesting. 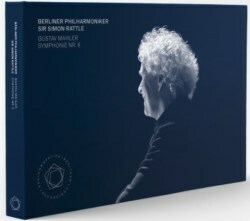 Naturally, a lot of the focus is on Rattle himself and his work with the Berliner Philharmoniker but it tells you quite a lot about the orchestra itself. Several members of the orchestra contribute fairly extensive comments about their departing chief. Unsurprisingly, the overall tone is positive – though I’m sure Rattle has his critics within the orchestra; it would be unusual for any conductor not to have critics – but even so a few mild reservations creep in so the portrait is pretty balanced, I think. Rattle also makes a good number of comments. What struck me is how much more Rattle has done in addition to “just” conducting. For example, we learn that the creation of the now-thriving Education Division was one of his conditions before agreeing to take the post and it’s apparent that he’s been a strong supporter of the Digital Concert Hall venture. These things, and other initiatives, have been part and parcel of his determination that the orchestra should reach out to the city of Berlin and to the wider world. There’s also, as I mentioned earlier, a short ‘bonus’ video in which Rattle introduces the symphony. Here he confronts head on the vexed question of the ordering of the middle movements. Hitherto I’ve preferred to hear the Scherzo placed second – even though I acknowledge that the weight of scholarship leans the other way. Rattle has, in two ways, largely convinced me that I’ve been wrong. Firstly, he points out that the exultant end of the first movement surely leads to and needs to be followed by the Andante moderato rather than the Scherzo. Even more importantly, though, he stresses the compositional link between the end of the Scherzo – and specifically its last three notes – and the very opening of the finale. That point is brought home by his decision to play those two movements attacca, something I can’t remember experiencing before. So, as well as hearing two memorable performances of Mahler’s Sixth in this set, I’ve been given a new understanding of a work I thought I knew reasonably well and for that I’m thankful. As is usual with this label, the discs come packaged in a hard-back cover which contains a lavish book, copiously illustrated and well annotated. This is a de-luxe package but the occasion it commemorates deserves that treatment. The Berliner Philharmoniker here marks the end of the Rattle era in some style.